The son of a schoolteacher and a newspaper worker, Dámaso Pérez Prado was set upon a musical path early in his life, training in classical piano techniques at the Principal School of Matanzas while still a young child. His earliest professional work was found playing organ and piano in local cinemas and nightclubs, but by the age of 26 Prado had relocated to Havana to seek out better opportunities. After a period spent performing with various small bands, he took a position as pianist and arranger with the Orquesta Casino de la Playa (the leading Cuban orchestra at the time) in 1943; this marked the beginning of both his explorations into the emerging style of mambo and his susequent rise to fame. In 1947 Pérez Prado left Cuba behind, having provoked the ill-will of members of the Cuban music industry due to his integration of non-traditional (jazz) elements into his arrangements. An attempt to find work in Puerto Rico proved fruitless, prompting him to join a group of musicians on a tour of major South American centers for the remainder of the year; the tour reached its conclusion in Mexico City in 1948 at which time Prado made the decision to settle there, assembling his own orchestra and finally launching his career as a bandleader. Popularity in his new home grew quickly, his band appearing as a frequent attraction at the upscale Club 1-2-3, and he himself becoming a highly sought-after Mexican film arranger and actor in addition to his work in the studio. A series of well-received 78s recorded with singer (and fellow Cuban expatriate) Beny Moré ultimately led to a contract with the Mexican office of RCA Victor, and the release of Prado's first internationally-distributed tracks, Qué Rico El Mambo and Mambo No. 5, in 1949. By the start of the 1950s the mambo craze (with Prado at its head) had entirely consumed Mexico and most of South America, and was beginning to sweep across the States via broadcasts on Spanish-language radio. The growing presence of his music in the mainstream charts convinced Prado to launch his first tour of the U.S. in 1951, but the undertaking was given a rough start: strict union rules forced the non-English speaking bandleader to make use of local musicians for his orchestra rather than his tightly-rehearsed Mexican band. Despite this complication, the shows were well-attended and only served increase his reputation. As his success in the mainstream grew, however, his standing in the Latin community diminished somewhat, the idea being that his take on the mambo was catering too much to whitey. With the release of Cherry Pink and Apple Blossom White in 1955, Prado earned his first #1, due in part to the song's (and the bandleader's) appearance in the Jane Russell sunken treasure flick Underwater!. A second #1 was not achieved until Prado's best-known offering Patricia in 1958. During this period of worldwide popularity, a conflict between Prado and his younger brother Pantaleón Pérez Prado arose over the latter also promoting his music under the name of 'Pérez Prado' (and the stolen tag-line 'King of the Mambo'). A lawsuit in 1956 eventually restrained Pantaleón from making use further of the name, but the confusion of identities arose once again at the time of the younger brother's death when several newspaper obituaries announcing "Mambo King Dies In Milan" (people naturally assuming that this referred to the older Prado). 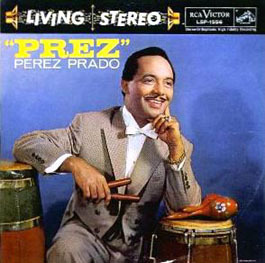 The enthusiasm for the real Prado's music continued throughout the 1950s, but by the early 1960s mainsteam interest began to wane and in 1963 RCA dropped him from their roster. Several attempts to initiate a new dance craze had already been made by this time - amongst which were the Suby, the Pau-Pau (both variations on the mambo), La Culeta (Prado's take on the cha-cha-cha), the Chunga and the Dengue - but none managed to catch on. His popularity in Mexico never diminished, however, and he remained active in his adopted homeland throughout the remainder of his life. A well-attended final appearance in the States was made at the Palladium in New York in 1987, two years prior to his death.